It’s one thing to read about the past. It’s quite another to suddenly be sucked into it. Uncle Richard plays a slightly more prominent role in this plot. He was such a mysterious and aloof figure in Rosi’s first adventure that I was pleased to get to know him a little better. The relationship between these two characters seems like it is terribly complex for reasons that have been hinted at along the way. I would have liked to have even more information about Uncle Richard’s gruff persona and why he made certain decisions, but I was glad to finally have answers to some of my questions about him. Rosi hasn’t grown or changed at all since I first met her. The first novel in this series sets up her personality and history so well that I was sure she would have had a chance to correct — or at least acknowledge — some of her faults along the way by now. By no means do I expect her to be perfect, but it was disappointing to see that she was as self-centered and critical as ever given all of the opportunities she’s had to learn from her experiences. Some of the most interesting scenes discuss the differences between linear and non-linear time. This concept was addressed in detail in Rosi’s Castle, but I was glad to see them brought up again. I’m so used to thinking about time as something that is measurable, concrete and not able to be revisited that the refresher was helpful. The pacing was slow at first. It would have worked better if this my was first introduction to Rosi’s world, but as someone who was already familiar with the background information I was antsy for the introductions to wrap up so the real action could begin. Approximately the first quarter of the plot is focused on this material. For me that was a little too much. While I would have preferred that the most important details from Rosi’s Castle were recapped more quickly, writing it this way does make it convenient to read this book out of order or on its own. The reader doesn’t need to know anything in advance. That is a good thing for this particular series, and I would suggest going back to the beginning to catch up on previous events to anyone who enjoys this tale. 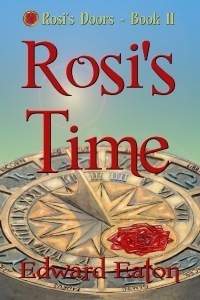 I’d recommend Rosi’s Time to anyone who like time travel stories.